Talk to Summer, who is found east of the Grand Exchange. Warning: The risk of dying in this quest is fairly high, so don't take items that you will regret losing. Armour doesn't really help against the attacks of the Beast. Also, however much you may dislike them, having the in-game sounds on helps tell you when actions are going to happen so you can run out of the way in time. 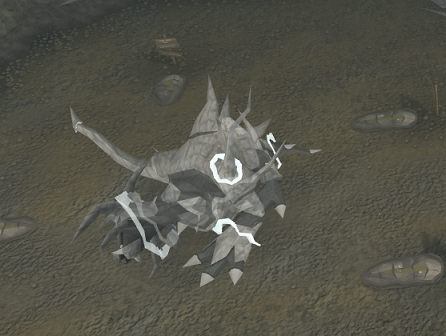 Head over to Summer who is found East of the Grand Exchange, near the Wilderness Wall. If you don't have your Jennica's ring anymore, simply search the rubble directly beside her and you will get another one. Talk to Summer, who will teleport you to the ruins east of the Wilderness Volcano. Once there, enter the portal and you will find yourself in the Void with four other spirits. They will tell you that they are trapped in the Void after being murdered, unable to move onto the next life as their souls are being sucked away by the Spirit Beast. 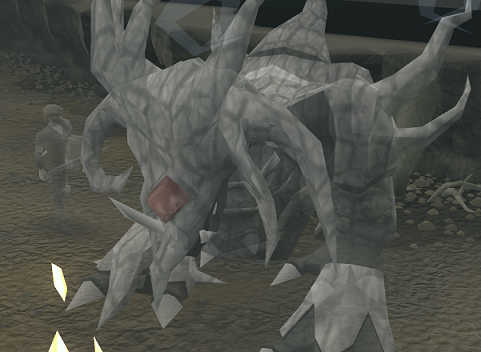 They explain that the Spirit Beast is gaining strength and attempting to enter the real world which would cause complete chaos in Runescape, so must be destroyed. After you're finished talking with the spirits you will emerge in the spirit realm. 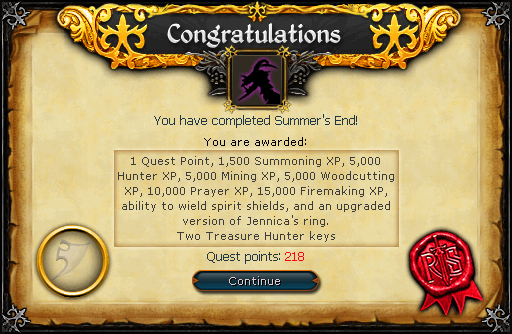 To enter or leave the realm, operate your Jennica's ring in the portal when worn. 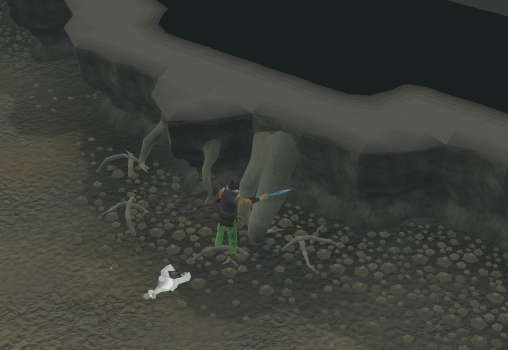 Return to Runescape and go north until you find a cave. Collapse it by choosing the right-click option. Return to the Spirit Realm by operating your ring when standing on the portal. 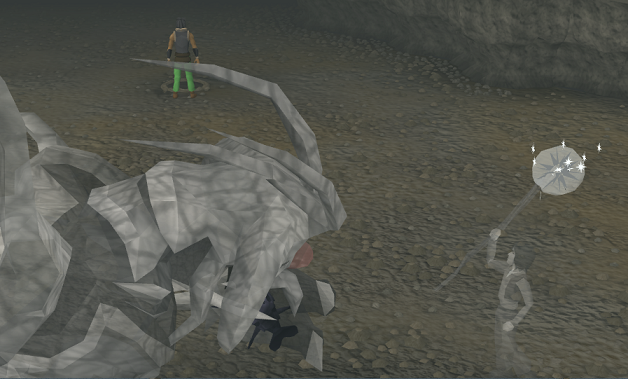 You now have to lure the Spirit Beast to the cave (which is unblocked in the Spirit Realm, as a result of you collapsing it in Runescape). To do this you have to use familiar made from a Blue Charm, such as a Giant Chinchompa, near the beast. (not too near as it will eat get eaten). Go back to the cave, making sure to avoid the beast and summon your familiar. As the beast loops around towards the cave get your familiar close so that the beast will follow it, enter the cave, and the beast will follow you. If the beast didn't enter the cave you need to try again. Remember to not get too near the beast as it will devour your familiar. Once inside the cave, the beast will start attacking you if you have told the spirit that you are ready to continue. Be extremely cautious, since it can hit upwards of 1000. The attacks are really easy to avoid since they target the floor and not you. If you die, your tombstone will appear on Summer's character northeast of Varrock. A good way to do this is to keep running, drinking Energy Potions to keep your Energy up. You will need your axe for this part. Throughout the cave there are some roots; you need to chop them until you get 15 Cursed Willow Logs. This can be hard since the beast will keep attacking you. A good way to get the logs is by chopping the ones in the picture and when you see the ground shake, move to another one. You won't get hit. After you've collected the logs you can place them in the fire pits. You need to light three pyres with five logs each. It should be noted that each time a fire is lit, the beast becomes angrier. Its attacks will become faster with an increased range. It is, therefore, better to not light any firepit until all three are filled with logs. Unfortunately, leaving the cave or dying means that any logs already placed in the firepits will disappear. A good strategy is to collect fifteen cursed logs in one go. If necessary, exit the cave and heal or replenish your energy. Then return to place them all into the firepits. 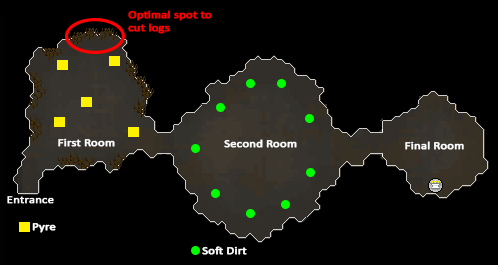 When adding the logs keep moving like in the previous step, don't try to place all the logs in a single attempt since you'll get hit. When you have added five logs to three different pits, light the pyre by clicking on it and a cutscene will appear. 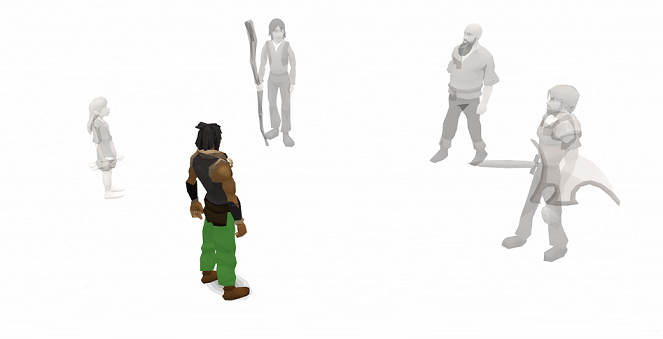 During the cutscene, use the minimap to get your character well away from the beast, preferably next to another filled firepit. Light the next as soon as you are able. After the third is lit, the beast will enter the next room. Now proceed to the next room by going through the passage. A cutscene will appear and you will talk with Jallek about the beast and its weakness. He'll tell you to lure the beast by digging holes and luring the Dark Core of the beast to them. Basically, when the beast comes out you need to dig a hole in the soft soil, but be quick since you may receive an attack like the ones in the previous room. Walk into the next room where you will see a cutscene with the three spirits and the beast in the background. They will tell you that you need to bless their graves according to the beast's actions. Each of the spirits will have a color and a shape. When a color and shape enters a grave, it means that the grave has been charged with that spirit. Bless the grave that has the colored spirit of the same color as the Beast's attack. So when the Beast is charging up his red colored attack, bless the grave that has the red colored Spirit in it. Bless each color once to defeat the creature. After that, speak to Summer and she will tell you to speak with the elders. Speak with them and they will take you out of the cave. Speak with them again outside the cave. Congratulations, quest complete! 5,000 Farming experience from using the ring at the quest's portal. 10,000 Thieving experience from using the ring outside of the Rogue's Castle (three steps east of a broom). 5,000 Prayer experience from using the ring at the Chaos Temple. 10,000 Defence experience from using the ring at the Dark Warriors' Fortress. 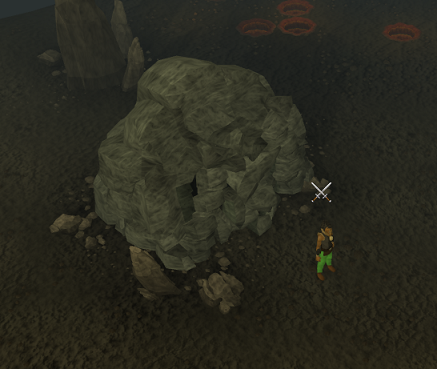 5,000 Smithing experience from using the ring in the center of the ruins East of the Demonic Ruins. 10,000 Farming experience from using the ring in the Ruins west of the Wilderness Bandit Camp. Requires level 50 Farming. 10,000 Prayer experience from using the ring in the Forgotten Cemetary located northwest of the Wilderness Bandit Camp. Requires level 50 Prayer. 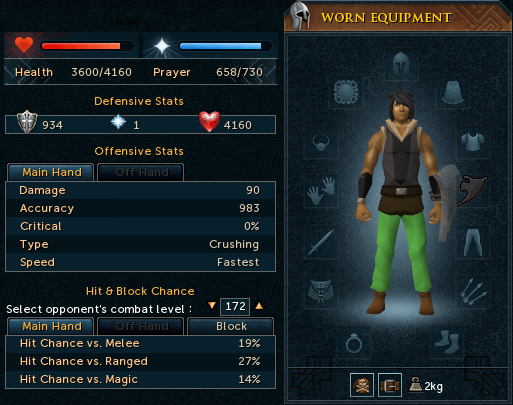 7,500 Attack experience from using the ring at the Wilderness Axe Hut located at level 55 Wilderness, and northeast of the Ardougne teleport lever teleport location. Required level 50 Attack. [^] Head over to Summer, who is found east of the Grand Exchange. [^] You will be teleported to the Spirit Realm, go back to RuneScape and go North until you find a cave, collapse it with your pickaxe. [^] Go back to the farm and enter the Spirit Realm. [^] Go north and you will see the beast, summon your Blue Charm familiar. [^] Get near the beast with your familiar and walk towards the cave making sure that the beast is following you. Enter the cave. [^] Carefully cut 15 Cursed Willow Logs from the roots, the beast will be attacking and it can hit up to 750 Life Points. Keep moving to avoid the hits. [^] Place 5 logs in one of the burners and light it with your tinderbox. Repeat it two more times. [^] Proceed to the next room and watch the cutscene. [^] When the beast's dark core comes out, dig a hole and lure it into it. Repeat it two more times. [^] Proceed to the next room and watch the cutscene, memorizing the spirits' colors and shapes. [^] Bless the grave of the spirit which the beast has the color and shape in its face. Repeat two more times. [^] Talk with Summer and with the Spirits.